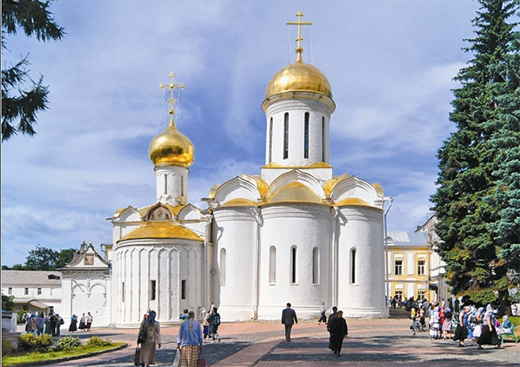 The Holy Trinity St. Sergius Lavra is one of the most sacred places in Russia. For centuries, many Orthodox Christians have set out on pilgrimage to the monastery. They come here to worship the relics of St. Sergius in anticipation of miracles, which can happen on this sacred land. The monastery was founded in the early 14th century by one of the most venerated saints of Russia: St. Sergius. Together with his brother he found a secluded place in the forest and decided to build a cell and a small wooden church in honor of the Holy Trinity there. St. Sergius' brother could not stand the rigors of this life and left him in solitude. Soon after, the word of St. Sergius’ isolated life spread over the lands. Some monks started searching for his guidance. St. Sergius met everybody with love and an open heart. However, he did not want to be their superior; he wanted to be their equal. He worked hard building the cells, fetching water, chopping firewood, sewing clothes, and cooking for the whole community. St. Sergius had many disciples who founded numerous cloisters later on. In 1380 he blessed the Russian Army, headed by the Grand Prince Dimitry (later named Donskoy) for the fight against the Tatar-Mongolian troops. His prediction of victory came true. The Tatar-Mongolian Army was defeated in battle on the Kulikovo field. It was the first major victory over the Mongols. Numerous miracles took place on this land. Lots of people were cured in the time of St. Sergius’ life as well as after his death. His holy relics - discovered in the early 15th century - were put in the shrine. Now they can be seen in the main and the most ancient church of the cloister, St. Trinity church. At all times this land attracted not only common folk but also people of noble origins, including Russian rulers. Each one contributed to the construction of the monastery. Tsar Ivan the Terrible commissioned the five-domed Assumption cathedral as a replica of the one in the Kremlin. In Peter the Great's time, a unique refectory with a church of St. Sergius was built. Catherine's époque was marked by the construction of an 88-meter bell-tower, the tallest structure built at that time. The monastery was given the honorable title of Lavra, and a seminary was founded at that time. According to a legend, the Mother of God appeared in a dream of St Sergius, and promised to be the protector of his cloister after his death. 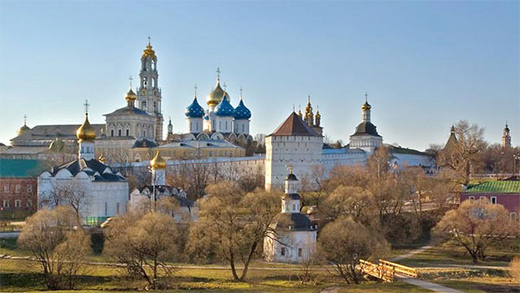 The Holy Trinity St. Sergius Lavra withstood the 16-month Polish-Lithuanian siege in the Time of Troubles. Napoleon’s Army did not even approach this cloister. In the times of the Second World War none of the bombs fell down on this sacred land. We invite you to visit the spiritual center of Russia, the Holy Trinity St. Sergius Lavra, which is included in our 5 day classic tour with your Moscow tour guide.